These photos look like Awkward Family Photos, don't they? 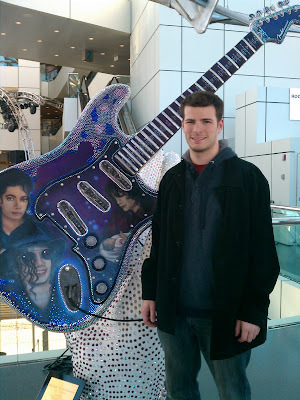 The photo of Steak was taken in the lobby of the Rock & Roll Hall of Fame. We drove to Westlake, OH on Saturday and spent the night. We got up bright and early on Sunday morning, grabbed some breakfast and then went to visit my grandparents resting place before heading into the heart of Cleveland to visit the museum. We made it home to Virgina late last night after a traffic gridlock in Pennsylvania. Steak took the photo of me this morning in our apartment building's lobby. 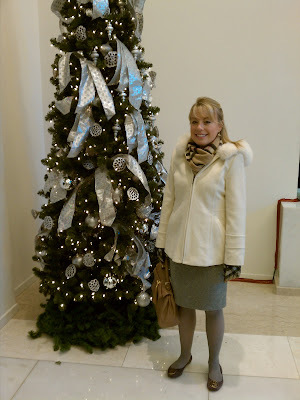 He wanted to document my new coat and skirt I got for my birthday from my mom. Thanks Mom! As you can see I'm already putting the new clothes to good use. haha cute pics! That coat is so pretty. Hope you guys had a great Thanksgiving!! A sweet, sweet love story.